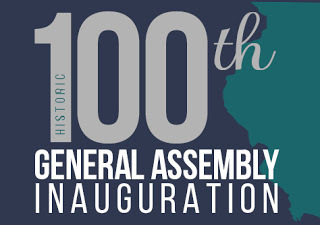 Dixon… State Representative Tom Demmer (R-Dixon) was sworn into his third term in the Illinois House of Representatives on Wednesday during the inauguration of the historic 100th General Assembly held at the University of Illinois-Springfield’s Sangamon Auditorium. Rep. Demmer cited an eagerness to reform Illinois budget and spending policies to protect middle-class families and promote economic growth. “As we stand at the precipice of 200 years of statehood, Illinois has challenges that are not insurmountable,” said Demmer. “These challenges should be viewed as opportunities to transform Illinois’ state government into a government that works for the people and competes for jobs and economic growth for the next 200 years.” “Too many of our young people are moving out of Illinois for education, for jobs, for opportunities. We have a window to help turn our state around and keep our children and jobs here in Illinois. I will fight with everything I have to fulfill that vision for Illinois,” said Demmer. 90th District residents can learn more about legislation sponsored by Rep. Demmer during the Spring legislative session at his website at www.tomdemmer.org.